It is not hard to understand the frustration and anger Palestinians and Arabs feel in the face of continued abuse by Israel’s government, whose policies are not only destroying any chance of peace, but also encouraging more violence and death. But the Palestinian and Arab world’s reaction to the Israeli government’s atrocities and its rejection of peace cannot be based solely on a foundation of frustration, anger or emotion. It needs to be based on strategy. Palestinians must build alliances, not by isolating Israel as a nation or the Israelis as people, but by confronting the extremism growing in the government. This week, the Central Council of the Palestine Liberation Organization voted to take steps toward suspending its recognition of Israel. It has also urged support of BDS (Boycott, Divestment, Sanctions). Those are good steps, but not enough. Palestinians commemorate the 6th Anniversary of the Israeli terrorist attack against non-violent civilian protestors aboard the Mavi Marmara during ceremonies in the Gaza Strip, May 30, 2016. Photos Copyright Mohammed Asad 2016, All Rights Reserved. Palestinians must come up with a broad strategy that defines achievable objectives. They must build coalitions based on the increasing recognition in Europe of Israel’s crimes. But they also need to build relations with pro-peace Israeli groups such as Peace Now, J Street, the New Israel Fund, Jewish Voice for Peace, Combatants for Peace, and all of the 20 organizations recently banned by Israel. Yet that’s still not enough. Palestinians need a campaign to pressure the Arab world to end all ties with Israel until Israel recognizes Palestinian statehood. This must be the foundation of making a real stand against the Israeli government’s anti-peace belligerence. As long as both Jordan and Egypt, the only two Arab nations to sign peace accords with Israel, continue to maintain relations with Israel’s government, nothing the Palestinians do can be effective. The PLO also needs to assume leadership of the BDS movement, which is unfocused and confused. Some BDS leaders rightly oppose relations with the racist and illegal Israeli settlements, but other BDS leaders demand a cessation of any ties to Israel or Israelis. The latter is destructive and empowers Israel’s extremist movement. A broad boycott of all of Israel emboldens the Israeli settlement movement, strengthening the right-wing anti-peace government. In following these strategies, the PLO can strengthen the Arab voice inside Israel’s semi-apartheid society. Instead of urging Palestinians living in Israel to boycott Israeli elections, they should demand that they vote and do so as a singular voice for peace. The Palestinians inside Israel have not fully flexed their muscles and they don’t understand their real potential to force change. The two-state solution is only dead if Palestinians and Arabs accept it is dead. It doesn’t matter what Israel’s apartheid government has done to block peace, expand settlements and even violate international laws in order to obstruct the implementation of the two-state solution. The two-state solution is still the only alternative to a future of endless violence and continued suffering on both sides. It’s not just Palestinians who know this, but many Israelis too. BDS must be led in a moral and ethical manner, one that doesn’t create enemies out of potential allies inside Israel. BDS must refocus on the settlements and articulate itself clearly as a movement that seeks peace. Doing business with the illegal Israeli settlements in the occupied West Bank and inside East Jerusalem is an international war crime. It also doesn’t matter what President Donald Trump says about Jerusalem, or whether the United States and a few crony governments such as the one in Guatemala move their embassies to Jerusalem. These actions can be reversed if the two-state solution is implemented. But you can’t defeat Israel’s extremism by embracing policies that are extremist themselves. There needs to be substantive improvement, not just in how Palestinians confront the Israeli government’s policies, but also in how they address the larger challenges such as the Arab world’s lack of unity and action in confronting Israel’s violations of international laws and human rights. Essential to all must be an ideological shift toward principles that can drive a successful strategy to confront extremism in Israel’s government. It requires a simple but effective communications plan to more effectively win over the hearts and minds of the world’s people. 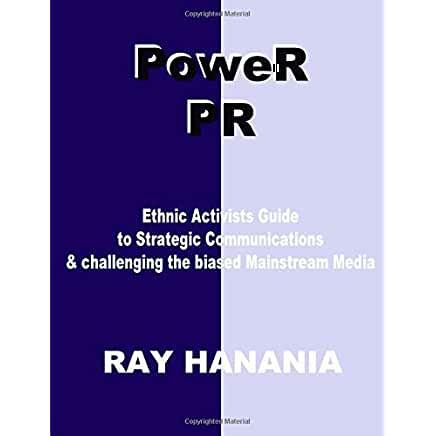 Most importantly, Palestinians and the Arab world must finally implement a public relations and public affairs strategy to influence and change American public opinion. Much of Israel’s power comes from two factors: The government’s total disregard for the international rule of law, and the blind support it receives from America. American politicians mislead the country’s people with lies, distortions and hypocrisy, but a powerful communications strategy can confront and expose those hypocrisies and lies. Americans, who are mostly Christian, might sympathize more with the Palestinians if they more clearly understood that Israel is not only violating the rights of Palestinians, but it is also violating the rights of Holy Land Christians. American Christians have never been fully educated about Israeli government abuses against its Christian citizens and the Christians in the Israeli occupation. Israel recognizes how important Christian Arabs are to Americans and it fully utilizes every opportunity to distort the truth by asserting that Israel is the protector of Christianity. It can’t be said enough that Christian Arabs have received more support from the Muslim Middle East than from any other region. Palestinians and Arabs must confront Israel’s misleading public relations propaganda, especially in America. And it won’t be as costly as some might think. It is OK to be angry in response to the Israeli government’s continued atrocities. Frustration, anger and emotion are justified. But if Palestinians and Arabs want to thwart the government’s extremism, they must reinforce their voice not just inside Israel but in America too. They need to reach beyond their anger and make peace with justice a reality. THIS POST HAS BEEN READ 1841 TIMES SO FAR. THANK YOU!